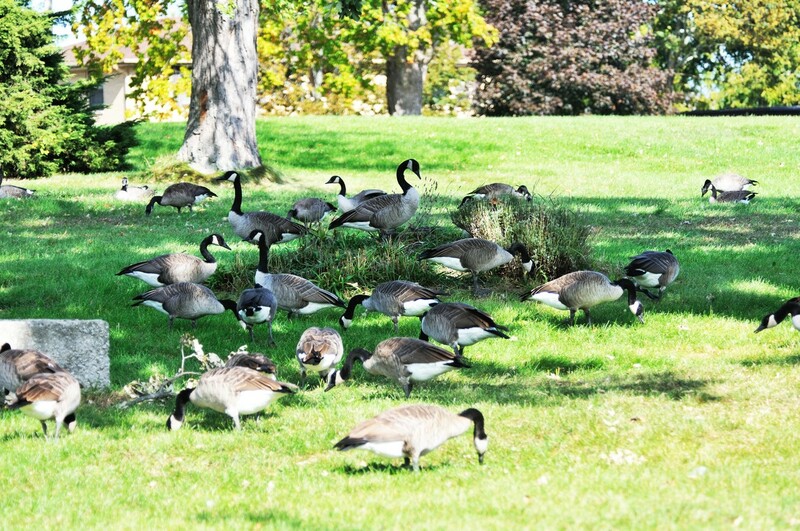 Every morning I wake up to a flock of Canada geese in my yard and they have to go. At first we didn’t mind having them around but now there are too many. And they’re messy. We have goose poo all over! They’ve been eating all my grass and shrubs and now they’re making nests in our garden too! I need some way to get rid of them and was looking at your sound repeller. 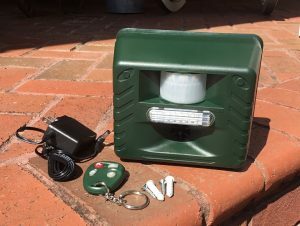 My back yard is about 1/4 acre so if this will work, how many do I need? Our SOUND REPELLER will definitely work for this problem. By default, it sends out an ultra sound people can’t hear. 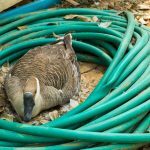 If you can use the included power supply and plug it in to a wall outlet, you won’t have any geese in the protected area. For a 1/4 acre that is fairly open like it looks in the picture you sent, two units should do the job. You’ll want to set them up close to the home pointing “out” toward the open areas where they like to forage and roost. Units can cover up to 4000-5000 sq/ft of open area. 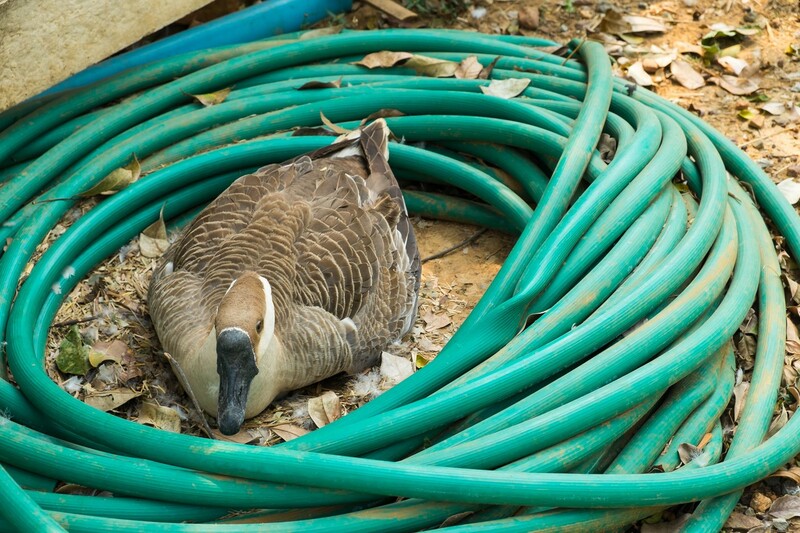 And when powered on all the time, will keep away geese. You should only need to keep the unit running during the day so the motion detector setting won’t matter. The Ultrasonic setting should be on Constant and the Sonic Volume on “0”. The yellow frequency know should be dialed toward the left pointing at the “B” for “Birds”. If AC power is not close and you need to power them by batteries, 4 “C” cells are what you’ll need. When using batteries, you’ll need to rely on the “motion detector” for triggering the unit. It will generally detect motion up to 40-50 feet away and then turn on the unit. Set them to be on during the “day” and dial up the motion detector sensitivity to 30. You should also dial up the audible sound so when units turn on, they’ll send an ultrasound as well as a loud audible sound. 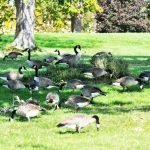 Dial this to 20-40; the audible sounds vary but help as they tend to scare the geese motivating them to move away for sure. We also suggest you get our MOUNTING BLOCKS so you can place units where they’ll be most effective. The blocks let you place units atop 1/2″ stakes like rebar so you can place them in the ground easily and almost anywhere you have dirt. Units should be placed 1-2 feet above ground and pointed in the direction where animals are entering as well as “over” the turf you want to protect.